You can find all switch plans and layout plans for Schaller switches and Megaswitches here. 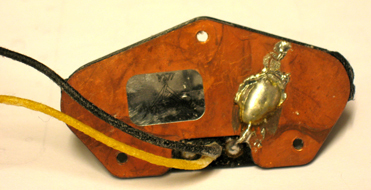 Soldering tags on the printed circuit are marked from 1-7 or from A-X. Mount the switch so the PC (Printed Circuit) is facing to the strings. This applies to normal right-hand guitars. On left-hand guitars, the plated side faces away from the strings. These switches substantially broaden the range of possible sounds on electric guitars. They allow coil combinations on the pickups which are impossible to create using conventional standard switches. Installation is simple – neither woodwork nor drill holes are required on the back plate . Simply remove the wires from the old switch by heating the connections with a soldering iron, then remove the switch and replace it with the Megaswitch. Solder the wires according to the diagram. Finished! E, E+, S, P, M, T.
This makes a huge range of sound possibilities available to you. Which Megaswitch is suitable for which guitar type? The Megaswitch switch symbols illustrate the following: blacked out points are real contacts and open points are switch positions which do not refer to contact function. The switch is in position 1 when the lever is positioned in the direction of the bridge. The wiring diagrams are illustrations of right-hand guitars, in which case the Megaswitch is built with the plated side facing the strings. Please note that left-hand designs are not quite reverse images. Here, the switches are positioned with the plated side facing away from the strings and the potentiometer (control knob) connections are reversed, since left-hand versions (i.e. "logarithmically negative” versions) and the control knobs with numbers in reverse order to match them, are rare. The electrical switch diagrams per se are more or less the same for both left and right-hand models. When the coils of various pickups are combined on a single instrument, they sometimes fail to work together, i.e. they operate out of phase. The resultant sound is very thin and hollow and the bass end lacks considerably, which is not necessarily desirable! When the pickups on a guitar are all made by the same manufacturer, they usually (but not always) work correctly. Complications are quite common when the pickups are made by different manufacturers. If you want to avoid this prior to installation, it is wise to inform yourself of the technical characteristics of the pickups you intend to combine. Unfortunately, manufacturers don’t usually make such information readily available to end-users. In technical jargon, so-called hot and cold connections are often referred to. The term ‘hot’ connections refers to wires that carry signal. If you touch them with your finger, your amp buzzes. Conversely, cold connections are those which are connected to the earth/ground, the zero potential, - the outer contact of the jack socket, the potentiometer housing, inner shielding, strings…If you touch these, no buzz comes out of your amp. Principally, hot and cold connections can only be clearly defined on pickups which have a single-core insulated cable, i.e. many old Humbuckers and single coils type P90 / P94. By contrast, the Stratocaster type doesn’t have a fixed hot and cold wire per se. They have two non-shielded cables i.e. they are symmetrical. In the case of Telecaster pickups, one of the wires becomes the cold one when it is connected to the metallic base plate, (on the neck), i.e. connected to the metal cap (on the bridge, figure 2) Both of these parts must be earthed/grounded. Some designs do not include the ground connection however. Instead, they have 3 wires, one on each of the two ends of the coil and the earth/ground wire (figure 3). These are symmetrical. Figure 2. Telecaster bridge pickup. With this model, the black wire is connected to the base plate. For some switch positions, this connection must be disconnected and the base plate is then connected via an additional wire to the earth/ground. This version has 3 connecting wires: black and white are wire windings and yellow is for the metal cap. Many models have just two wires, in which case the black wire is connected to the cap. However impractical the hot wire is often referred to as plus and the cold wire is referred to as minus. These terms originate from the world of direct current. By contrast, pickups only use alternating current. Nevertheless, pickups do have a kind of electrical polarity or operating direction. When a single pickup operates alone, polarity is insignificant. However, as soon as two or more are in operation this polarity becomes important. Terms such as coil base, coil end and coil direction aren’t really helpful here. Likewise, a better definition than plus or minus is the following: You need an analog multimeter (moving-coil instrument). This kind of measuring device has become somewhat out of fashion in recent years but is still available and is quite useful for some applications. A rather simple model which costs under 100 Euros is adequate. You select the most sensitive current setting, e.g. 50 microamperes and connect it to both ends of the pickup. You then bring something metal such as a scissors close to the pickup and allow it to be pulled towards the pickup by magnetic force. (Figure 4). The measuring device reacts by pointing to the far left or the far right. When you remove the metal object (such as the scissors) again, the needle points in the opposite direction. On testing a number of different pickups, it becomes apparent that some of them show a positive, then negative reading, whereas other pickups generate a negative, then positive reading. Similarly, if you test the polarity of a pickup and then switch the pickup connections, a second reading illustrates the opposite characteristics. The electrical polarity of a pickup is defined at best as follows: It should be connected so that the needle points to the right when a metal device (e.g. a scissors) enters its magnetic field and points to the left when the metal device is subsequently removed. When the pickup is connected accordingly, the connection which is made to the plus pole of the instrument is indeed plus, and the other connection is minus. Figure 4. Testing the electrical polarity of a pickup. It is worth noting that in practice, the white wire is not always plus and the black is not always minus. It is equally possible that the opposite is the case. Similarly, the generalization that shielded cables are always inner = plus / outer = minus cannot be taken for granted. In practice, the designation of plus and minus is quite arbitrary. Each manufacturer decides for themselves and rarely defines which is plus and which is minus, therefore it is strongly advisable to test the connections accordingly. Whereby two pickups are switched in parallel, both minus poles and both plus poles respectively must be connected with each other in order for them to operate correctly. In the event that the pickups are in series, such as in a Humbucker, the minus pole of one coil is connected to the plus pole of the other coil. This causes the signal voltage to be added together. If an opposite phase combination is desired, the plus pole must be connected to the minus pole of two coils in parallel operation. The opposite is the case if they are to be switched in series, i.e. either both plus poles are connected together or both minus poles. The best so-called out-of-phase sounds are obtained when both coils which work against each other are positioned as far apart as possible. On a Stratocaster, for example, these would be the neck and the bridge pickup. It makes no sense to switch the coils ‘against’ each other within a single Humbucker for example, since they literally cancel each other out and the signal becomes extremely quiet. Many musicians find it annoying when buzz or hum from the amp is audible while they are playing. This occurs with common single coils. They pick up magnetic alternating fields from the vicinity caused by electrical transformers in amps, line-level devices such as effects units and from ambient sources such as fluorescent lamps and overhead wires for trains and trams. The Humbucker was invented in order to solve the problem. It is made of two coils which are combined to cancel out interference from outside sources. To avoid the string sounds from compensating each other, the magnetic north poles point in the direction of the strings through the one coil, the magnetic south poles point through the other. Usually, both coils are in series. This doubles the signal, i.e. the output voltage is twice as strong as from a single coil. This also occurs with parallel switching, which is possible on guitars that are fitted with more than one single coil. The nearest single coil or ‘immediate neighbor’ is given ‘reverse wound, reverse polarity,’ RWRP. On a Stratocaster, at least in the second and fourth switch position, the resultant sound of the instrument is buzz-free. As a rule, an even number of coils must be switched on at a given time with an equal number of north and south pole coils. It is irrelevant whether they are parallel or in series. In any event, they must be switched as outlined above. Using a Megaswitch is somewhat more complicated. Here, for example, one coil of a Humbuckers on the bridge is switched in parallel with a single coil in middle position. If buzz-free operation is desired, then these must be north pole and south pole. Furthermore, plus must be connected to plus and minus to minus. Here, it is important to establish which magnetic polarity a single coil has before assigning the switch positions so that when the Humbucker is split, the coil which has the opposite magnetic polarity operates at the same time. 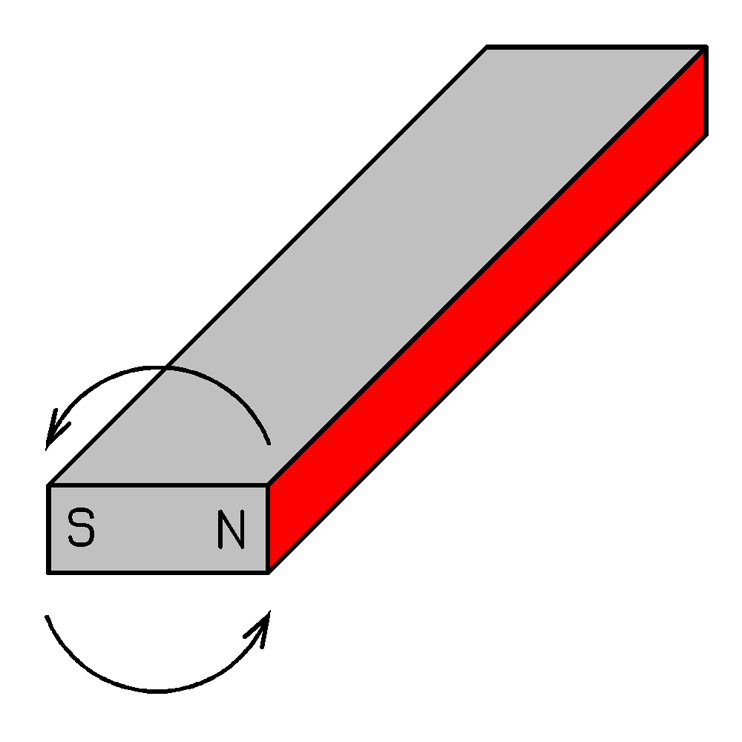 How can you establish the polarity of a single magnet? Tie it on one end of a piece of thread and let it dangle in the air at least a half a meter away from a large metal object. Initially it moves, but after a short period it comes to rest in a given position. The end which points to the north is the north pole; the other end is the south pole. (In the vicinity of the earth’s geographic north lies the magnetic south pole!) This also works with single coil pickups which have single magnets or with a single bar magnet under the coil. It doesn’t work with Humbuckers or with single coil pickups that have two magnets under the coil, such as the P90 or the P94. To establish the polarity of such devices, take a single magnet or a single coil the polarity of which is known to you and test how it attracts and repels the pickups you wish to test. A minimum of 1 cm distance from the pickup must be maintained. The physical law whereby the same poles repel each other and opposites attract is demonstrated when (1) the distance between both magnets is big enough and (2) both magnets are of similar strength. Magnets which differ greatly in strength always attract each other over short distances because the stronger one reverses the polarity of the weaker one. It is important to avoid being misled by this. In some cases, the opposite magnetic polarity to that which has been supplied by the manufacturer is required. Although Fender type single coils cannot be altered in this way, Humbuckers can usually be changed. On the underside, the four small screws which hold the coils in position are removed. The base plate is then removed, the magnet is turned around as illustrated below, and the part is reassembled i.e. screwed into position accordingly. On P90/P94 pickups, both magnets must be turned. It should be noted that the electrical polarity is also changed by doing this. The plus poles become the minus ones and vice versa. When a buzz-free out-of-phase sound is desired, two coils with the same magnetic polarity must be switched opposite to one another to achieve it. A completely buzz-free result can only be obtained if both coils have the same number of winds. 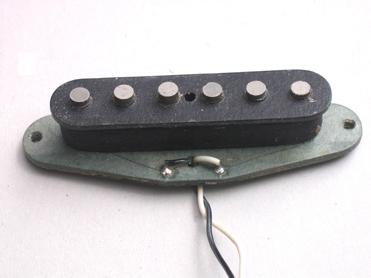 A typical Humbucker which has been manufactured with care usually has identical coils. This is not the case, however, when two different Humbuckers are switched to single coil position, i.e. are split and the remaining coils are used together. The same applies to a split humbucker and a single coil. The number of winds on the coils often differs, which causes incomplete compensation and therefore, residual hum. Although it is not ideal, it is considerably quieter than the hum generated by a single coil by itself. With four-wire Humbuckers, the question often arises, which wire goes on which coil? The answer depends on the brand. A black wire can correspond to a red, green or white one, for example, which means it is important to consult the instructions. 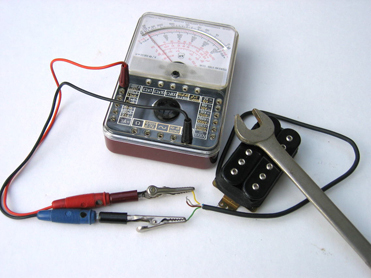 If the instructions are not available, this can be established quite simply using an Ohmmeter. The typical resistance of a coil is approximately a few Kilo-ohms. Which pair of wires belongs to the coil with the adjustable screws and which ones belong to the one with the fixed poles? This information is rarely included in the instructions. You can test it yourself by soldering a jack socket and connect the coil with a guitar cable with an amp that is switched on. You touch the poles in turn gently with a small metal device such as a screwdriver. The pole which makes a loud cracking noise is the one to which the wires should be connected. These colors must then be altered according to the individual colors of a particular manufacturer. It has become common practice to use control knobs with 250 kOhm for single coil pickups and those with 500 kOhm for Humbuckers. This is not a hard and fast rule, however and neither is it always the case in practice. Generally, the following applies: With 500-kOhm volume control knobs, higher frequencies are more accentuated than with 250-kOhm volume control knobs. The difference is not substantial, however. If someone using single coils wants a brighter sound, they can replace their 250-kOhm volume control knob with a 500 kOhm version. Conversely, the high frequencies of a Humbucker can be reduced by switching to a 250-kOhm volume control knob. In essence, the choice of volume control knob is a matter of taste and the resultant sound depends largely on the amp. In any event, trial and error, rather than theory is the best policy. When the volume control knob is turned down to reduce the volume the sound usually loses its brightness. This undesirable ancillary effect can be reduced by installing i.e. soldering a small capacitor between the input (i.e. the right position) and the output (the wiper). Optimum values here are 330 pF, 470 pF or 680 pF. The eventual choice is a matter of taste. These capacitors are not illustrated in the switch diagrams. It is also worth noting that, with passive pickups, the characteristic transfer of sound also depends on the capacity of the guitar cable. This is due to a physical phenomenon and cannot be avoided.